Yesh Atid changes mind, will support initiative to implement the MK Removal Law in the case of Basel Ghattas. 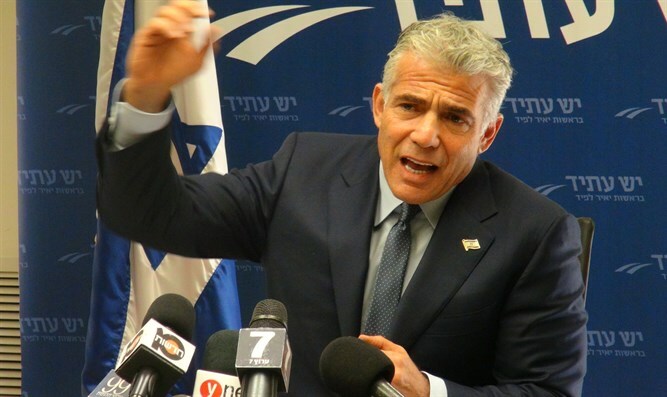 Yesh Atid chairman Yair Lapid is planning to sign on Monday the document that would begin the process leading to the dismissal from the Knesset of MK Basel Ghattas (Joint List), who is suspected of assisting terrorists in Israeli prisons, Channel 2 News reported Sunday. Jerusalem Affairs Minister Zeev Elkin (Likud) several weeks ago called on MKs to sign his initiative for the MK Removal Law to be implemented in the case of Ghattas. Lapid refused to sign, however, saying at the time “that would be an idiotic procedure” and claiming that implementing the law would delay the trial of Ghattas. According to Channel 2 News, even though an indictment has been filed against Ghattas since that time, the members of Yesh Atid have noticed that the indictment has failed to result in his resignation from the Knesset and thus changed their minds about going along with Elkin’s initiative. Signing the document would be consistent with Yesh Atid’s statement from two weeks ago, when the party declared that it would be willing to back Elkin’s initiative if Ghattas is indicted. After Lapid and his party sign the document, the Zionist Union would come under pressure to sign it as well, noted Channel 2 News. This is due to the fact that applying the MK Removal Law requires the support of at least 90 Knesset members, so at least half of the MKs from the Zionist Union would need to support the move. In December, Ghattas was accused of smuggling cellular devices in to security prisoners at the Ktziot prison in southern Israel, allowing them to continue to manage terror operations from behind bars. Ghattas also allegedly acted as a go-between, carrying messages to and from jailed terrorists. While Ghattas initially denied the charges, during police questioning he later acknowledged smuggling cell phones and carrying messages for the jailed terrorists, though he claimed the messages were not terror related.